You can easily embed the course on your own website so that learners can take the course without leaving your site. If you are a premium member with ProProfs then you can completely brand the course with your own logo and remove the "Powered by ProProfs" link. Your audience will not even know that you used ProProfs for creating the course as it will look completely a part of your website content. Any changes you make to your course (such as editing questions etc) appear in the embedded version right away - without you having to re-install the embed code. Step 2: Click on "Embed". 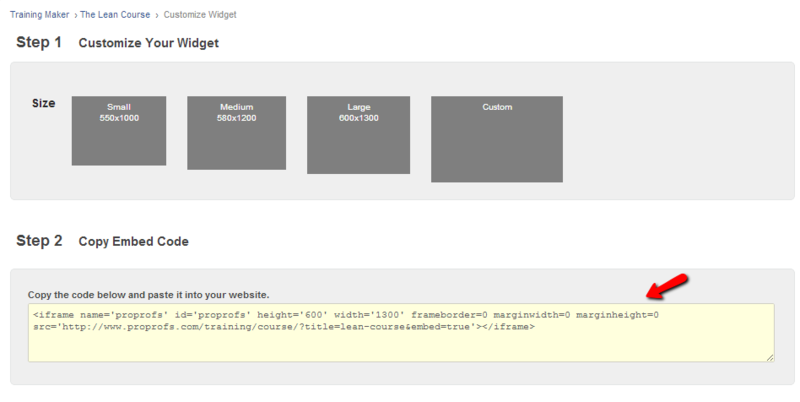 Step 3: Click on "Customize & Embed". Step 4: Customize as needed and then copy the code.